Prof. Om Prakash Singh Negi has joined on 8th February, 2019 as the Vice Chancellor of Uttarkhand Open University, Haldwani. 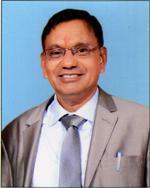 Prof. Negi has 35 years of experience of teaching of Post Graduate and Under Graduate classes. He has been actively engaged in research since last 37 years on various problems of: High Energy Physics, Quantum Field Theory, Relatively and Gravitation. Prof. Negi completed B.Sc. (PCM) and M.Sc. (Physics) from Garhwal University. He has received his Ph.D. from Kumaun University, Nainital. He has also held various key positions in past including Head of the department, Chairman in BOS, Member of University Court for 6 years at Kumaun University, Nainital. He was Chief Procter, Chief Warden, Program Officer NSS at SSJ Campus, Almora. He was main contact CISCO, Assistant Coordinator, IT. He was also a Member in Academic Council, Member of Professional/Academic Studies in SSJ Campus, Almora and presently he is a member of NAAC Pear Team Visit, Bangalore. He has more than 35 years of experience of guiding research. 12 research Scholars have already been awarded Ph.D. degree in Physics under his supervision. More than 250 Research Papers and articles were published in the journals of International repute. His research worj has been widely quoted and cited. He has authoured 02 Book and edited 03 Books. Prof. Negi has been the DAAD (German Academic Exchange Service) fellow, UNESCO-TWAS Fellow, Fellow of Chinees Academic Science. He visited abroad to attend Conferences and Scientific interactions. Prof. Negi has the quality of Enthusiasm, Trustworthiness, creativity, discipline, respectfulness, determination, dedication, versatility and honest for post assigned for. He has the quality to accept the challenges interims of humble in nature, timely and firm decision making and flexible to maintain quality, talent and diversity.